Giraffes and zebras and elephants, oh my! 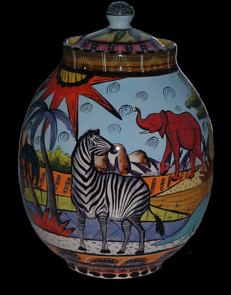 I wandered down some path on the web today, and wound up in Africa - or at least with African pottery from Penzo. These lovely pieces are handmade, and signed by the artist; each is one of a kind. What a way to contain your whatever! 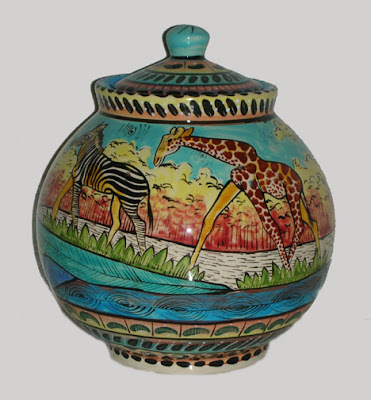 Anjely Antiques and African Pottery is one place to buy these pieces on-line; the pot above comes from their site. Another site, in the Netherlands, shows us this lovely cookie jar. Penzo products can be bought at stores throughout the U.S., and at a much smaller number of outlets in Europe. And here's more good news. "A generous portion of proceeds from the sale of Penzo is given to causes that directly benefit both wildlife conservation and the ongoing attempt to educate native Africans to observe and report corruption, poaching and other abuses that continue to endanger their animals and preserves."